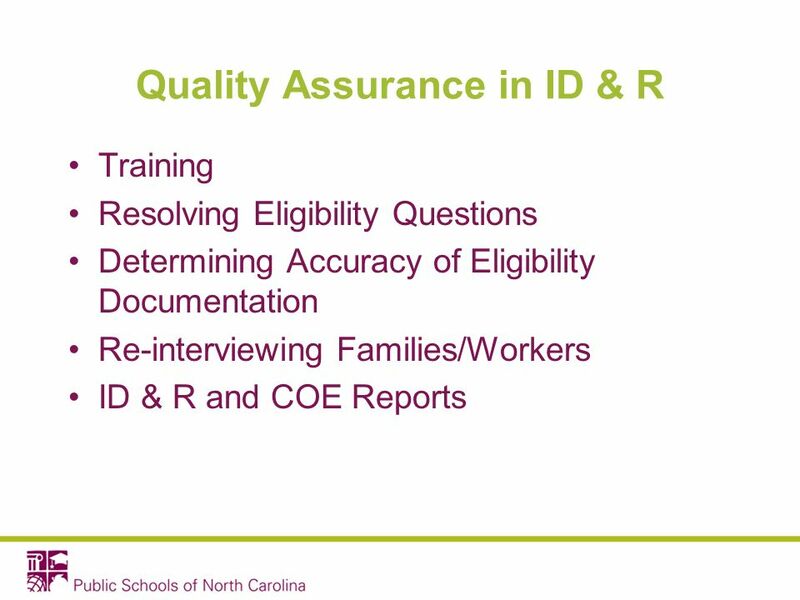 North Carolina Migrant Education Program Quality Assurance System. 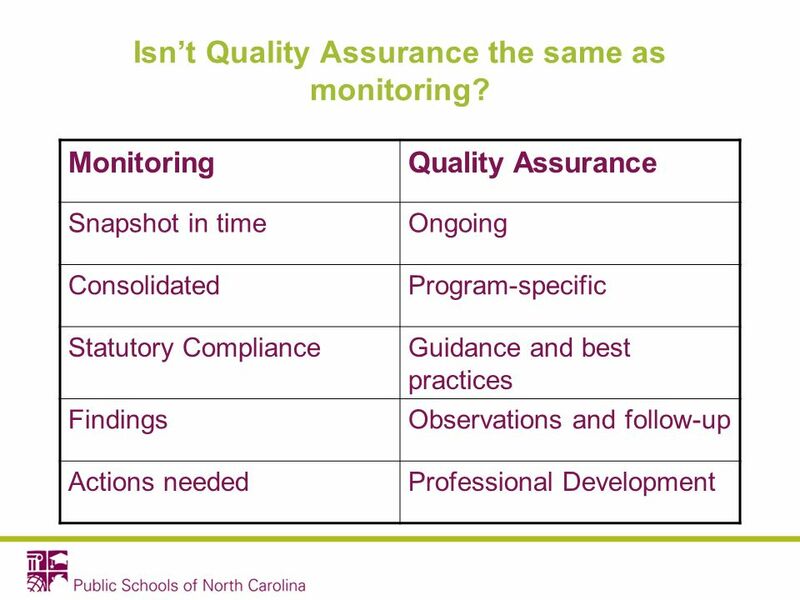 2 What is Quality Assurance? 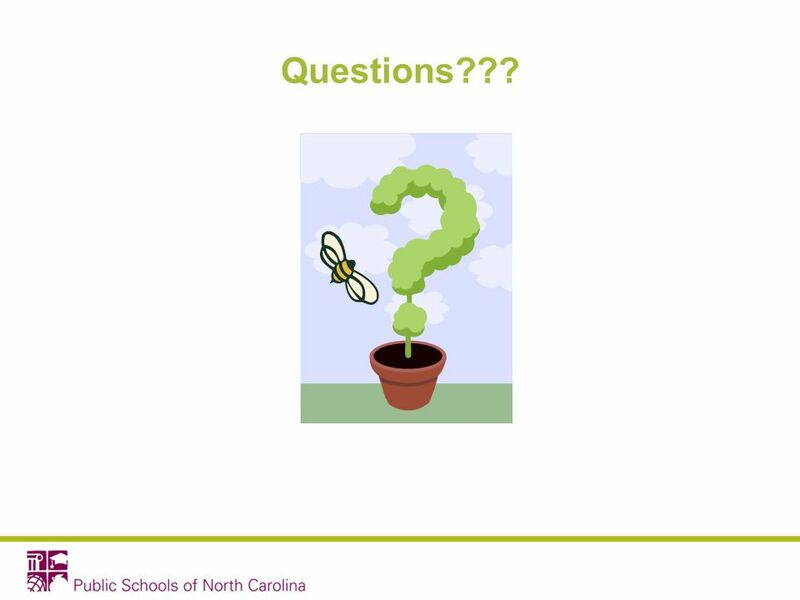 Our goal at NC Migrant Education is to promote a high-quality program that is based on the needs of migrant students. 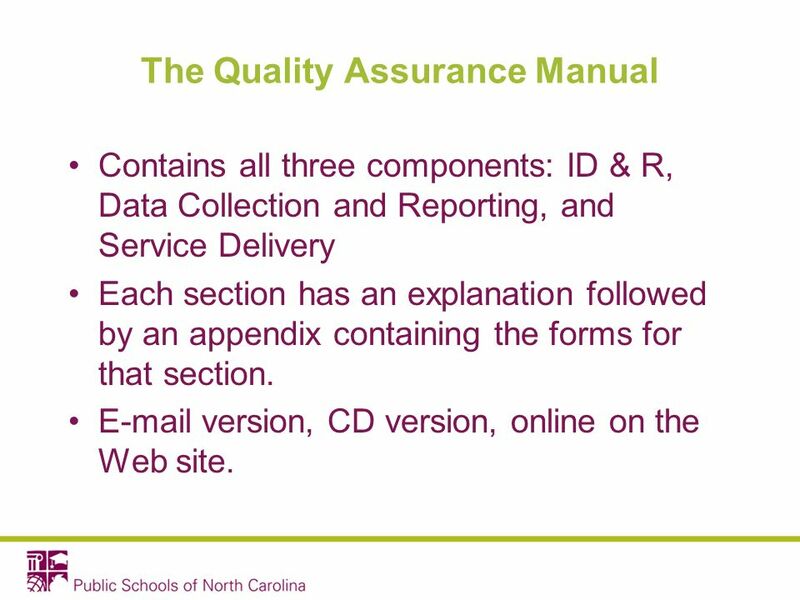 6 The Quality Assurance Manual Contains all three components: ID & R, Data Collection and Reporting, and Service Delivery Each section has an explanation followed by an appendix containing the forms for that section. E-mail version, CD version, online on the Web site. 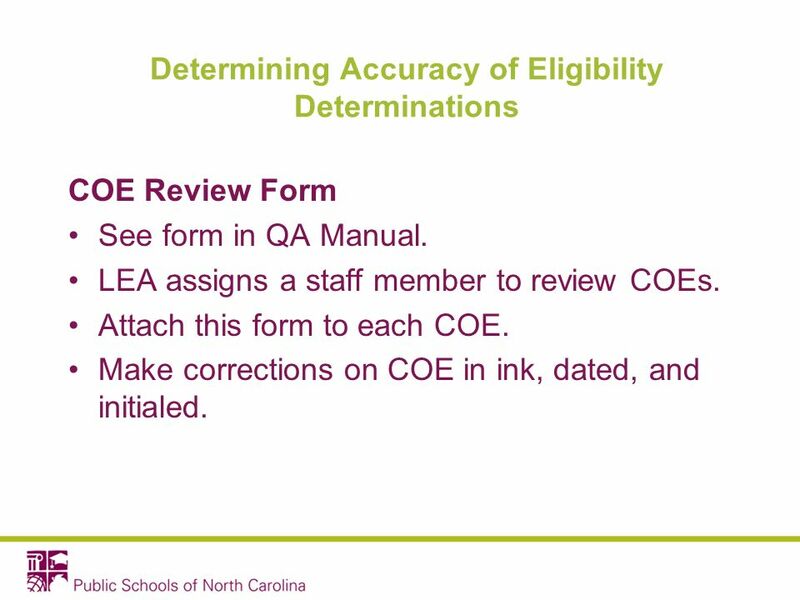 11 Determining Accuracy of Eligibility Determinations COE Review Form See form in QA Manual. LEA assigns a staff member to review COEs. Attach this form to each COE. Make corrections on COE in ink, dated, and initialed. 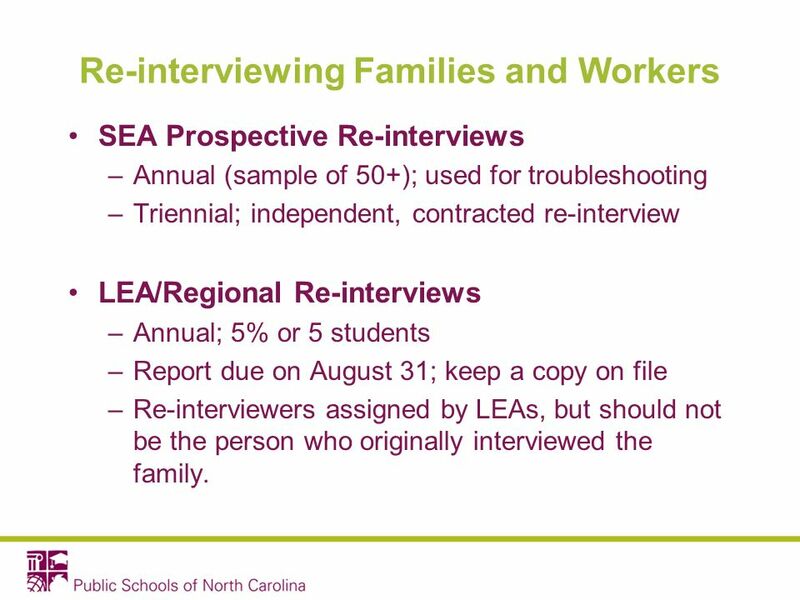 12 Re-interviewing Families and Workers SEA Prospective Re-interviews –Annual (sample of 50+); used for troubleshooting –Triennial; independent, contracted re-interview LEA/Regional Re-interviews –Annual; 5% or 5 students –Report due on August 31; keep a copy on file –Re-interviewers assigned by LEAs, but should not be the person who originally interviewed the family. 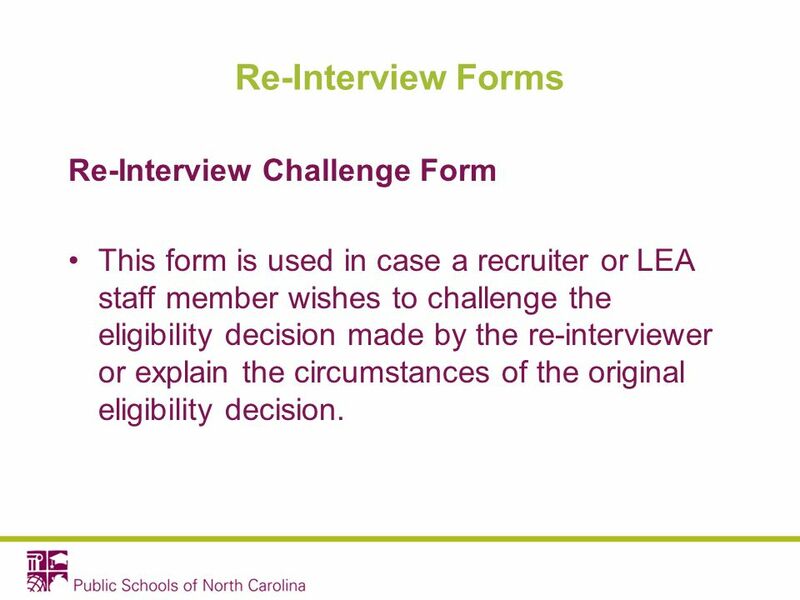 13 Re-Interview Forms Re-Interview Challenge Form This form is used in case a recruiter or LEA staff member wishes to challenge the eligibility decision made by the re-interviewer or explain the circumstances of the original eligibility decision. 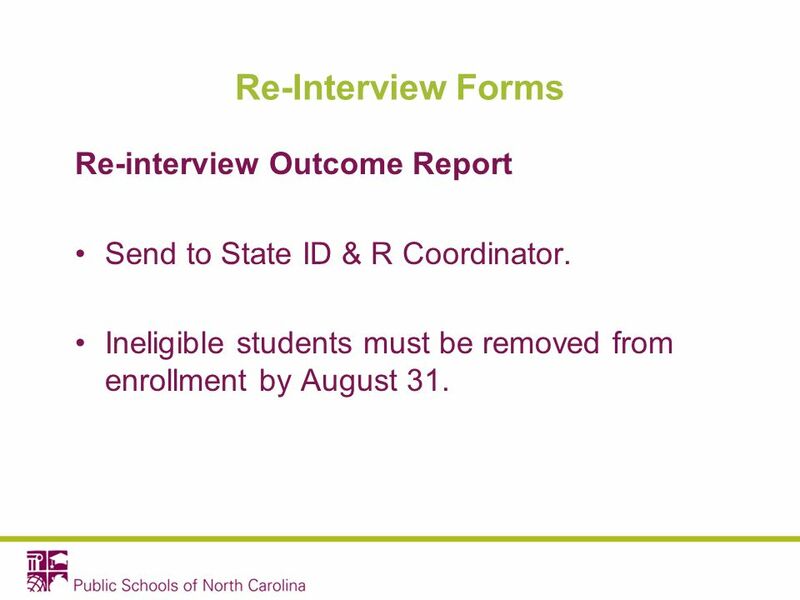 14 Re-Interview Forms Re-interview Outcome Report Send to State ID & R Coordinator. Ineligible students must be removed from enrollment by August 31. 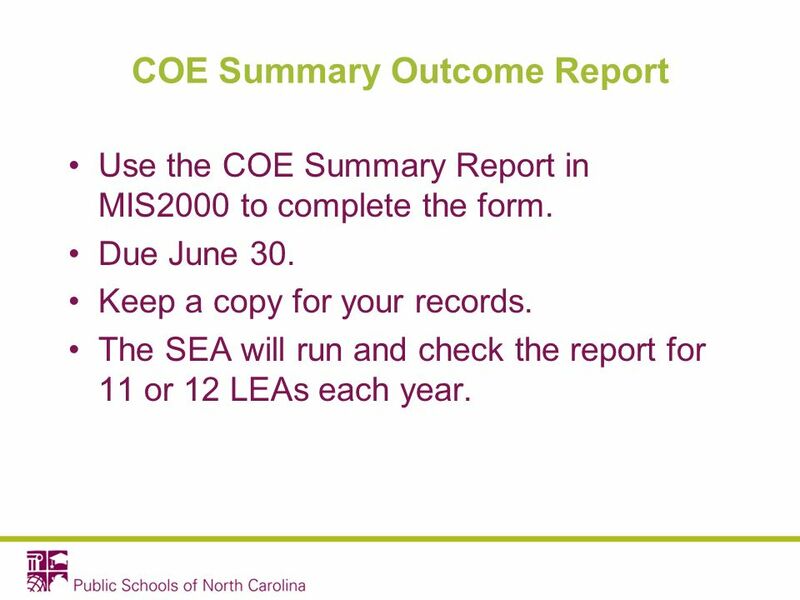 16 COE Summary Outcome Report Use the COE Summary Report in MIS2000 to complete the form. Due June 30. Keep a copy for your records. The SEA will run and check the report for 11 or 12 LEAs each year. 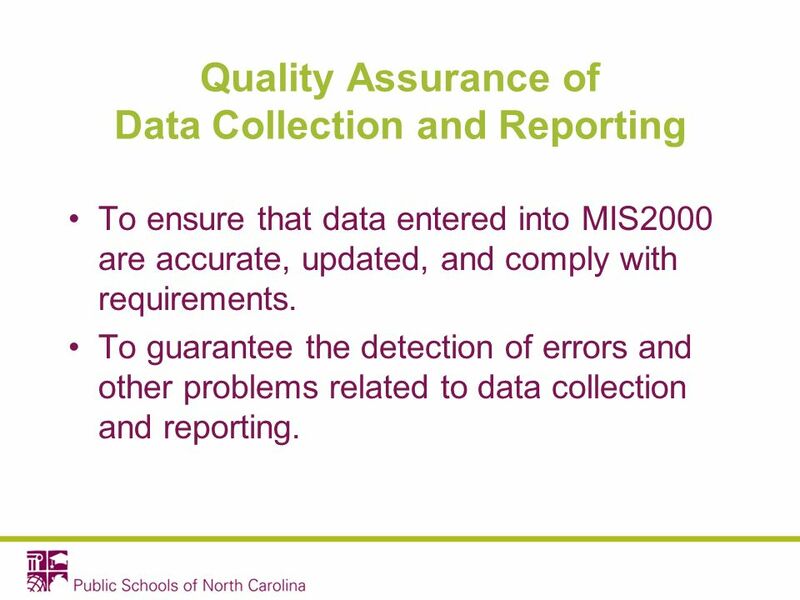 21 Quality Assurance of Data Collection and Reporting To ensure that data entered into MIS2000 are accurate, updated, and comply with requirements. To guarantee the detection of errors and other problems related to data collection and reporting. 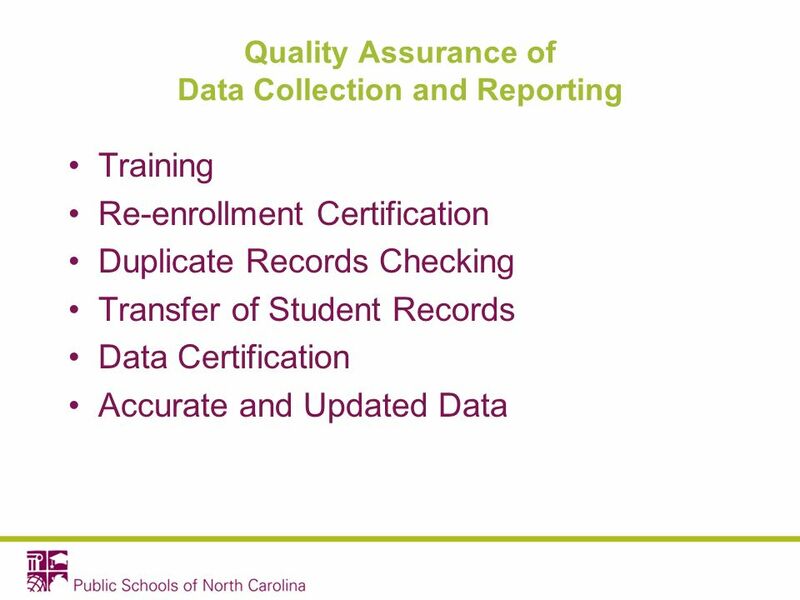 24 Data Collection and Reporting Re-Enrollment Certification Enrollment verification must be conducted by each LEA and Regional Data Specialist at the beginning of each school year and summer period. 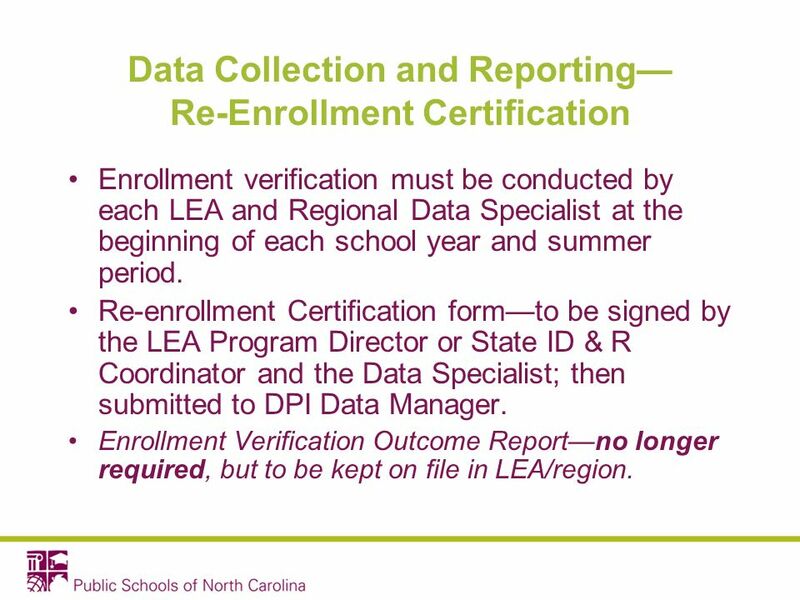 Re-enrollment Certification formto be signed by the LEA Program Director or State ID & R Coordinator and the Data Specialist; then submitted to DPI Data Manager. 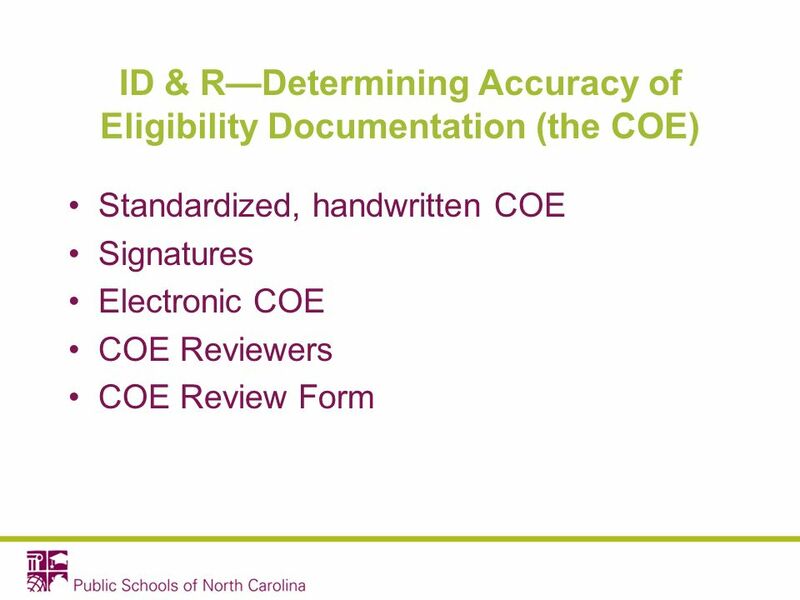 Enrollment Verification Outcome Reportno longer required, but to be kept on file in LEA/region. 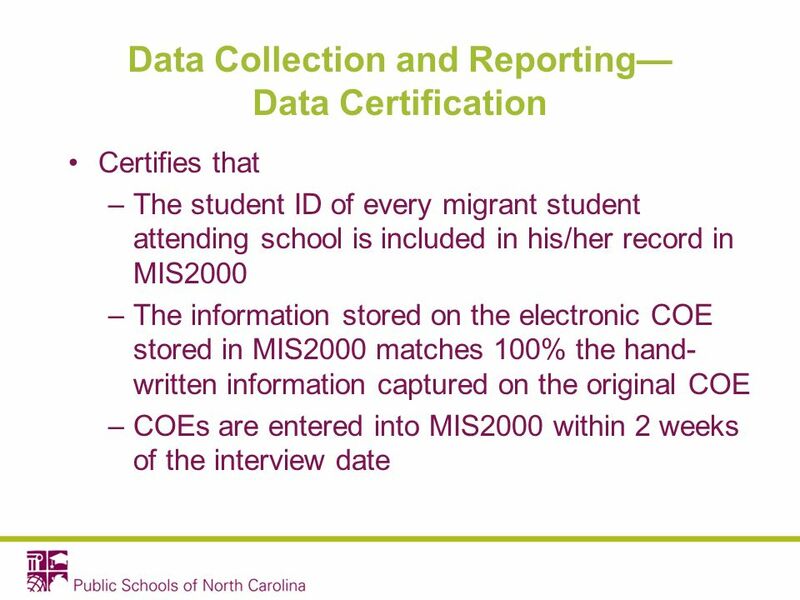 26 Data Collection and Reporting Transfer of Migrant Student Records Evaluation Report Submitted by local programs to DPI on August 31 of each year. Records of transfer should be kept on file. 28 Data Collection and Reporting Data Certification Certification will be signed by local program Director and Data Specialist or in the case of LEAs not having a Migrant Education Programby the Regional Data Specialist and the DPI MEP Data Manager. 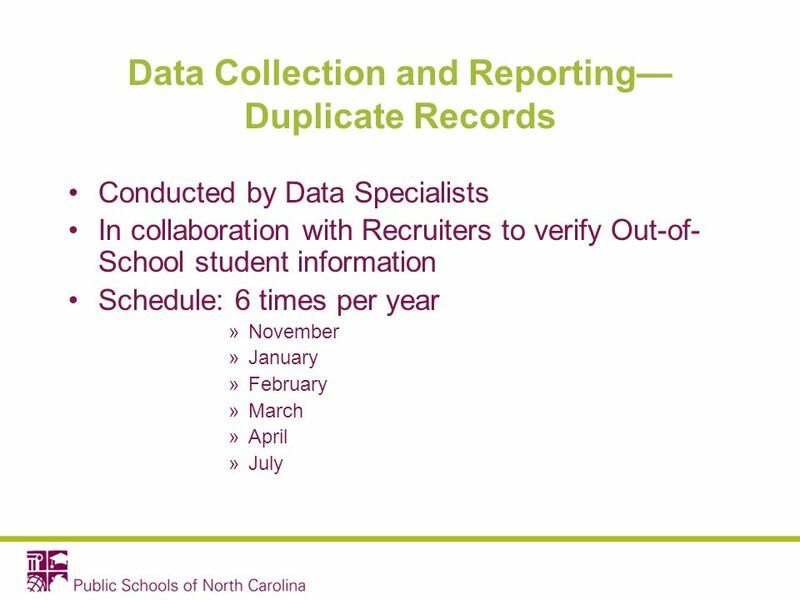 29 Accurate and Updated Data A random sample of 50 students will be run for the entire state, and each students data will be reviewed for accuracy and timeliness. 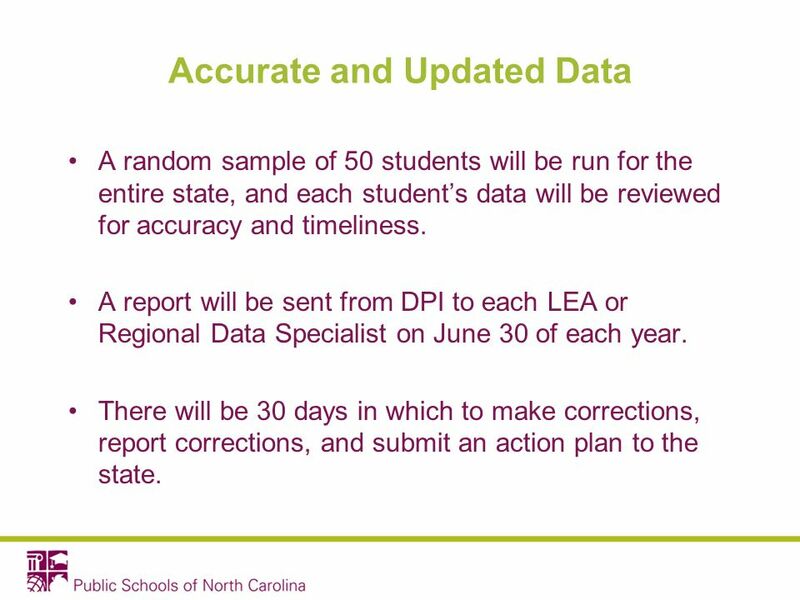 A report will be sent from DPI to each LEA or Regional Data Specialist on June 30 of each year. There will be 30 days in which to make corrections, report corrections, and submit an action plan to the state. 30 Survey Question How do you feel about data collection and reporting? 1.I know how to collect AND report. 2.I know how to enter data, but I need help reporting on the data. 3.I need help. 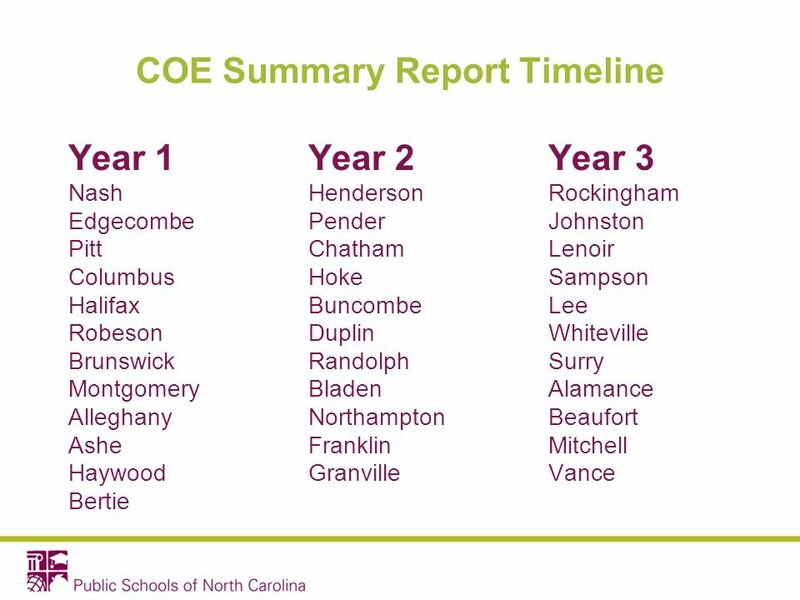 31 Quality Assurance of North Carolina Migrant Education Service Delivery Service delivery throughout the state should be based on the NCMEP Service Delivery Plan. 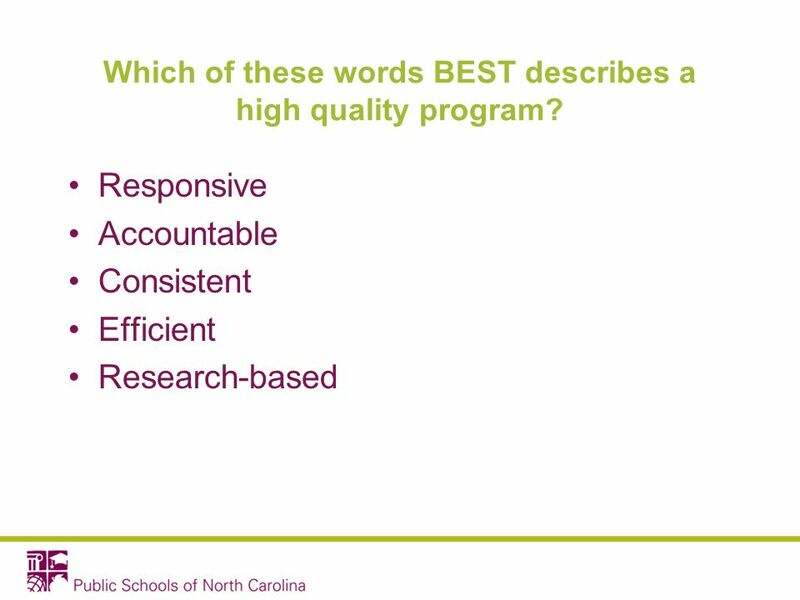 The Quality Assurance Process helps programs document their services, show alignment with the Service Delivery Plan, and demonstrate use of best practices. 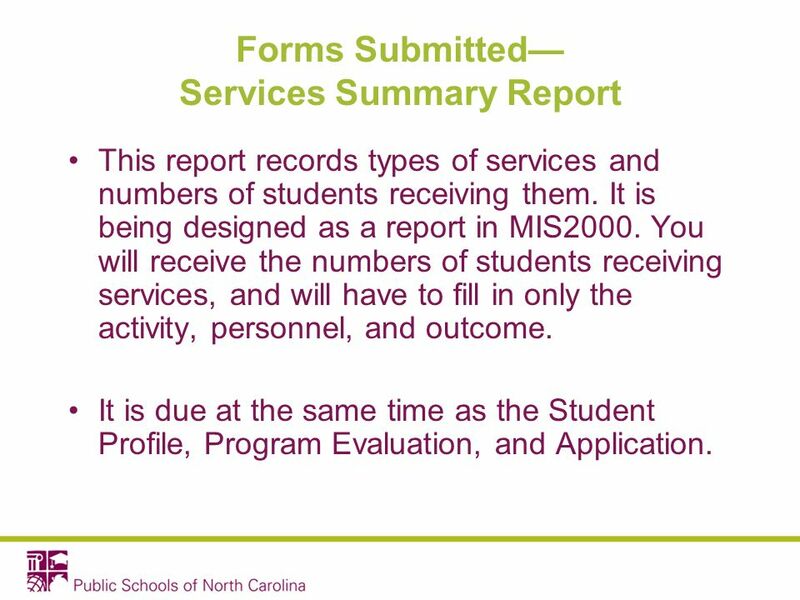 33 Forms Submitted Services Summary Report This report records types of services and numbers of students receiving them. It is being designed as a report in MIS2000. You will receive the numbers of students receiving services, and will have to fill in only the activity, personnel, and outcome. 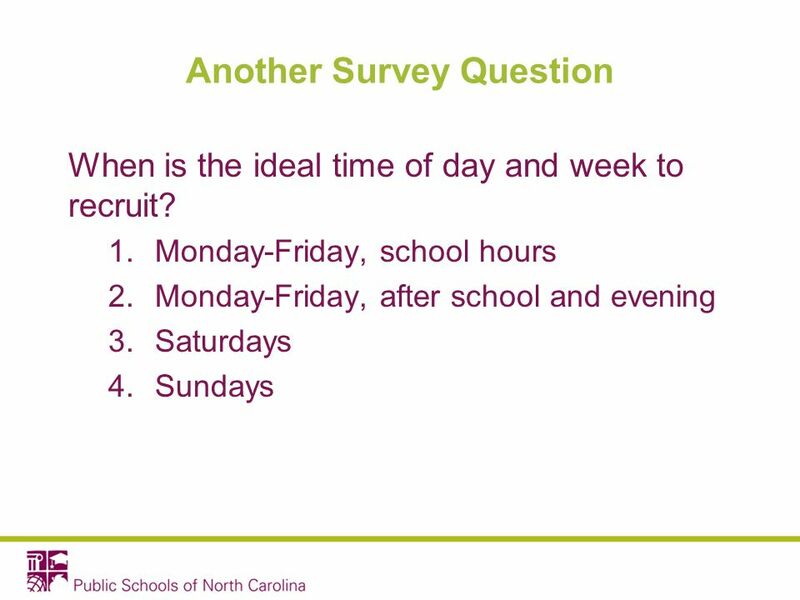 It is due at the same time as the Student Profile, Program Evaluation, and Application. 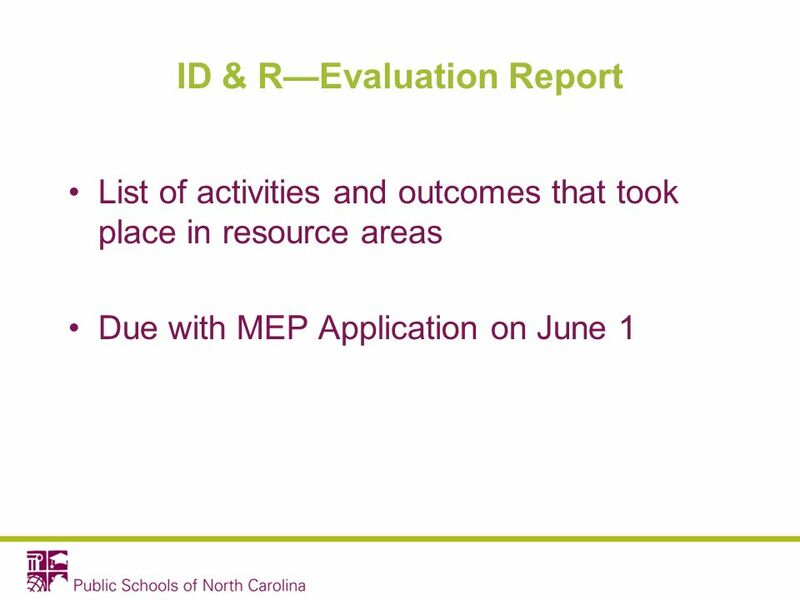 34 Reports Submitted Program Evaluation This evaluation is submitted with your Application. 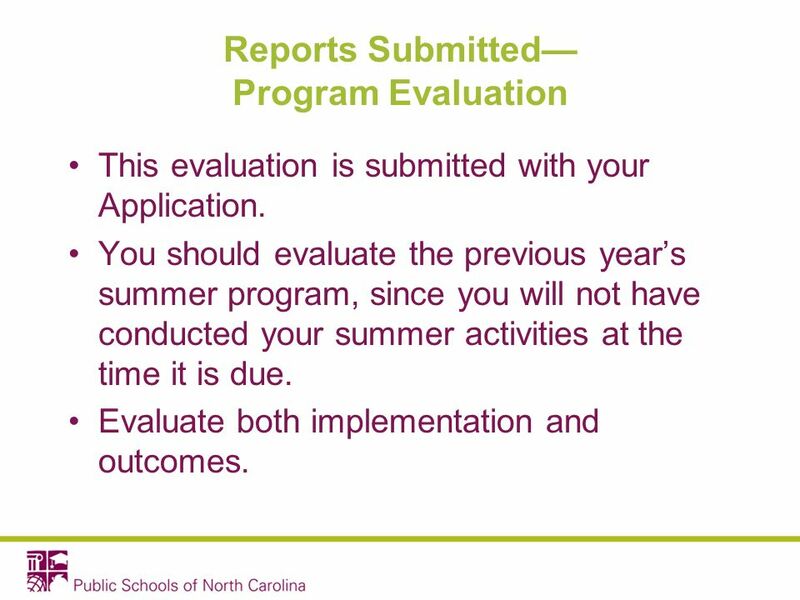 You should evaluate the previous years summer program, since you will not have conducted your summer activities at the time it is due. Evaluate both implementation and outcomes. 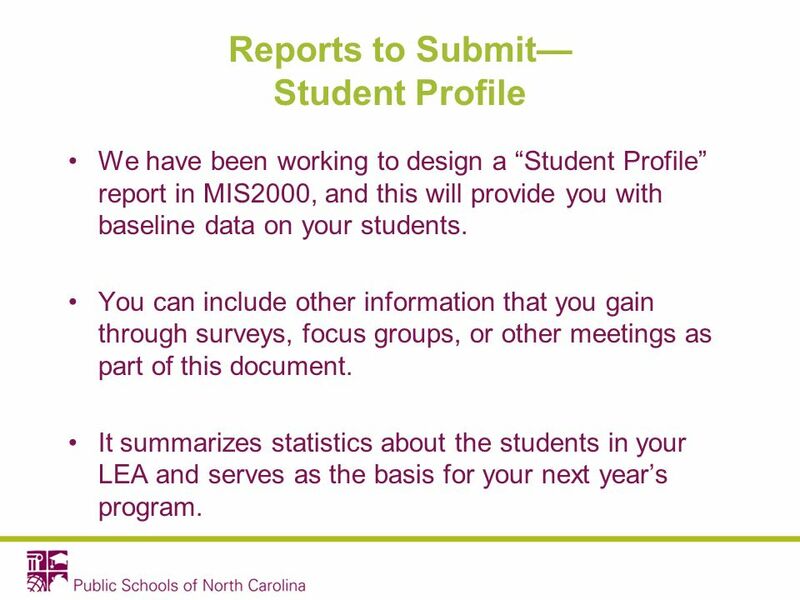 35 Reports to Submit Student Profile We have been working to design a Student Profile report in MIS2000, and this will provide you with baseline data on your students. You can include other information that you gain through surveys, focus groups, or other meetings as part of this document. It summarizes statistics about the students in your LEA and serves as the basis for your next years program. 36 Service Reports to Keep on File OSY Services This report gives you a space to report how you serve your Out of School Youth. 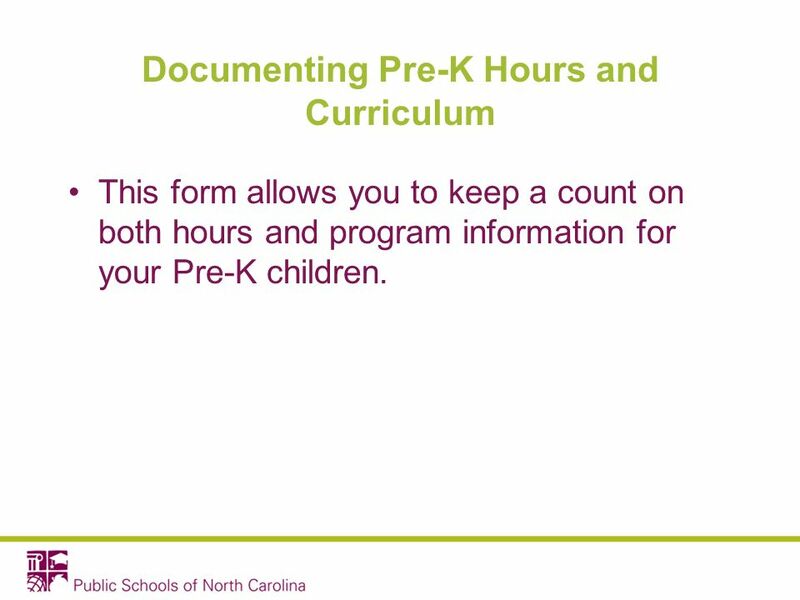 37 Documenting Pre-K Hours and Curriculum This form allows you to keep a count on both hours and program information for your Pre-K children. 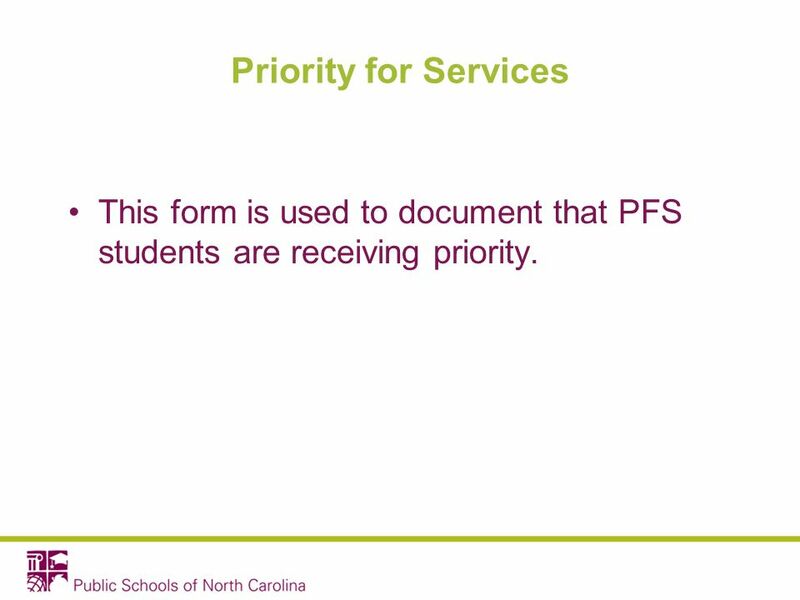 38 Priority for Services This form is used to document that PFS students are receiving priority. 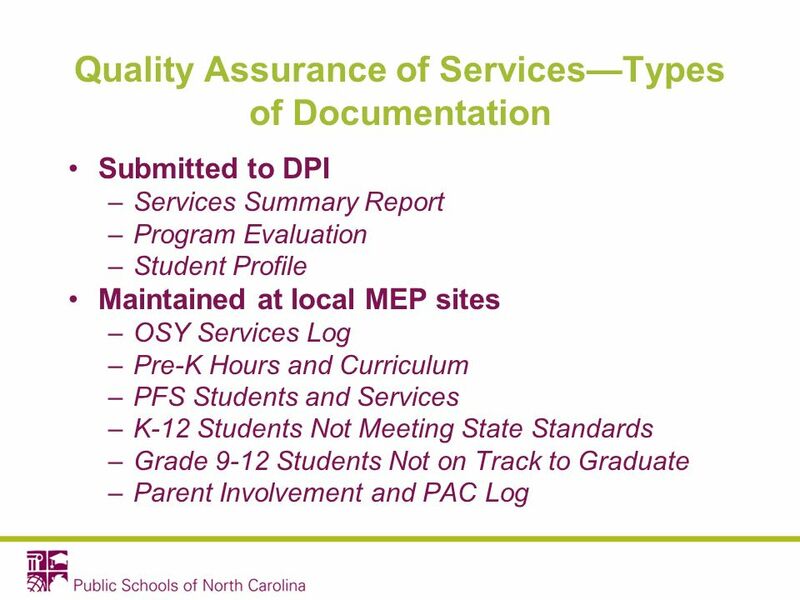 39 K-12 Students NOT Meeting State Standards This documentation provides an ongoing log of students who are at-risk. It provides a place for recording strategies used to serve those students. 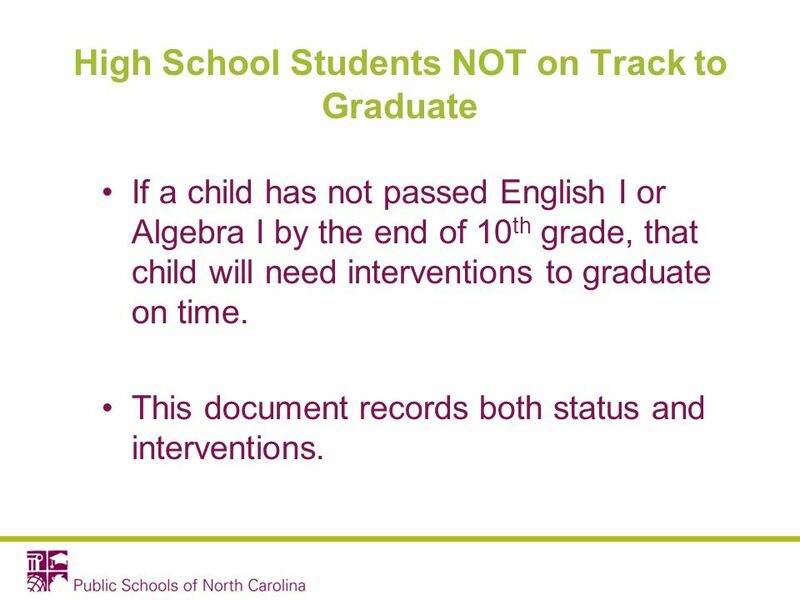 40 High School Students NOT on Track to Graduate If a child has not passed English I or Algebra I by the end of 10 th grade, that child will need interventions to graduate on time. This document records both status and interventions. 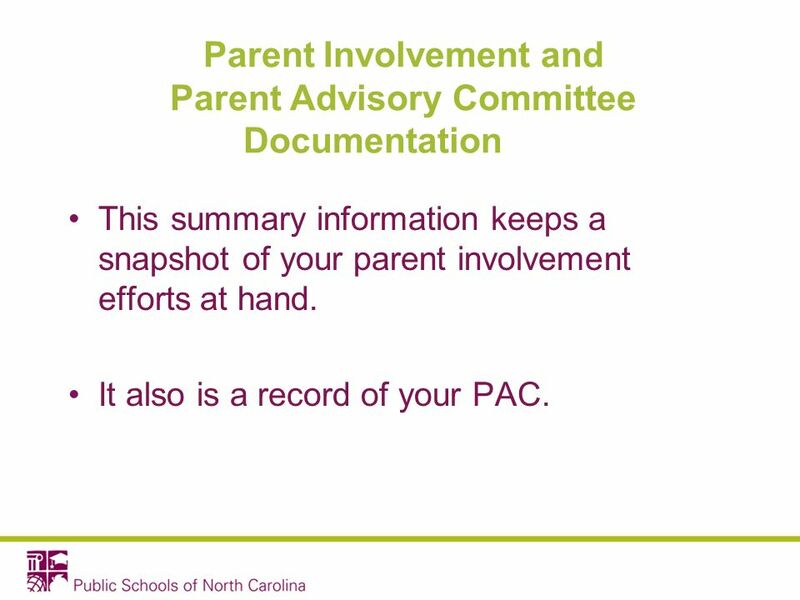 41 Parent Involvement and Parent Advisory Committee Documentation This summary information keeps a snapshot of your parent involvement efforts at hand. It also is a record of your PAC. 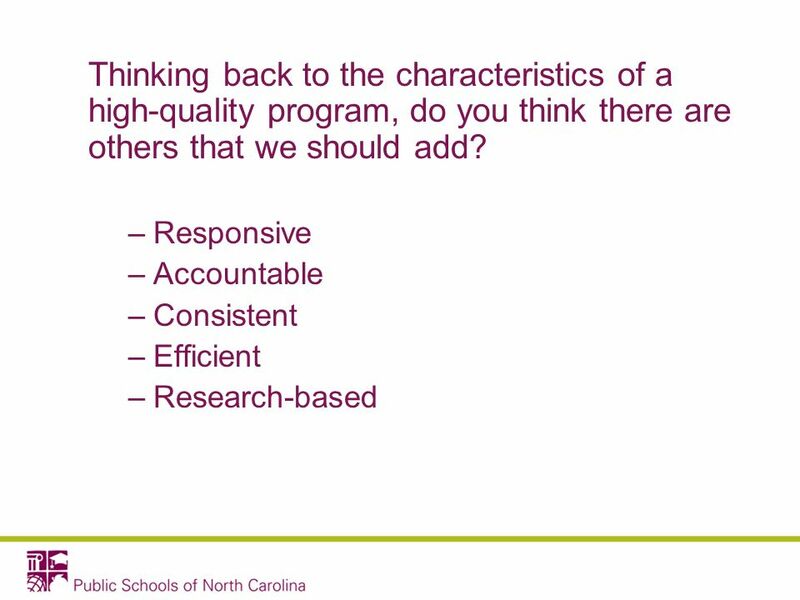 42 Survey Question Would you like some regionally based follow- up to assist you in implementing the Service Delivery Plan and Quality Assurance System? 1.Yes. 2.No; Im good to go. 3.Maybe; I need some time to digest this! 44 Next Steps Use the Service Delivery Plan, along with your student data, to develop your goals and objectives for next year. Contact us if you would like help in this process. Dont be shy! Volunteer to be on the next CNA team. 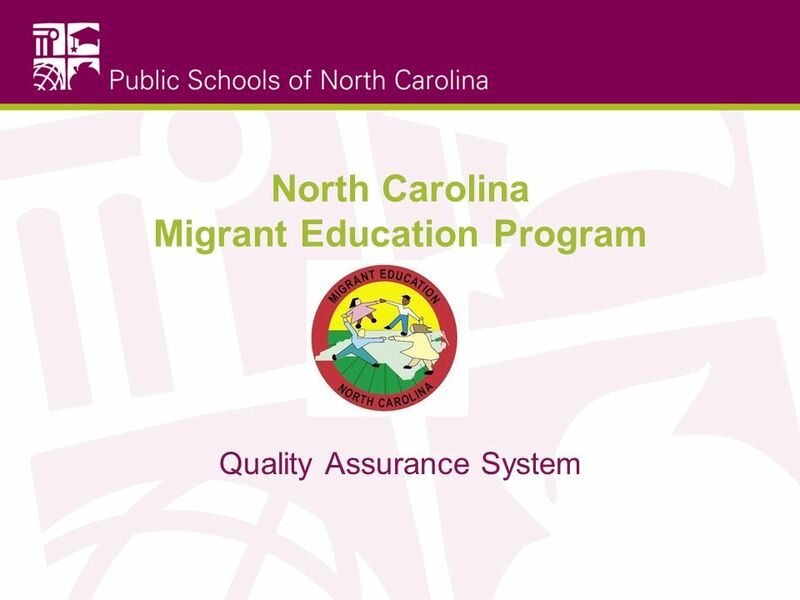 Download ppt "North Carolina Migrant Education Program Quality Assurance System." EC Grants and Fiscal Monitoring Presentation to Charter Schools July 29 and October 28 NCDPI Valencia W. Davis, Consultant. 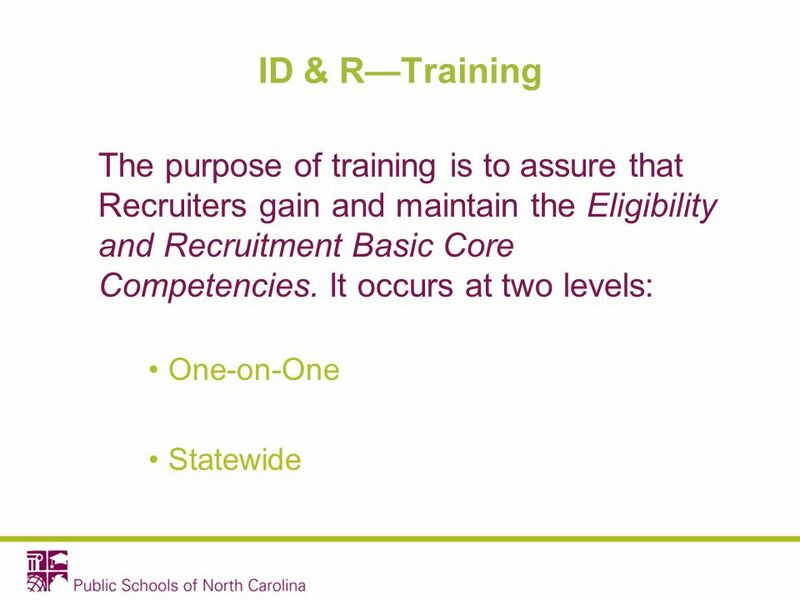 ___________________________ NCDPI Division of Accountability Services/North Carolina Testing Program North Carolina Alternate Assessment Academic Inventory. State Performance Plan (SPP) Indicator #14 Post School Outcomes Study Cohort III: Exiters Technical Assistance Session #2 Presented by The New. October Topics covered in this video: How to complete Progress Towards Goals How to make sure your Home Page Alerts are accurate How to be sure. CONSOLIDATED PROGRAM REVIEW COMPLIANCE REQUIREMENTS FOR TITLE I, PART C, MIGRANT EDUCATION PROGRAM MEP STATE CONFERENCE AUGUST 2013. Understanding & Complying with the Idaho Migrant Education Program Mary Lou Wells & Merced Flores Idaho Title I Conference April 2013. 5/2010 Focused Monitoring Stakeholders May /2010 Purpose: Massachusetts Monitoring System  Monitor and evaluate program compliance with federal. 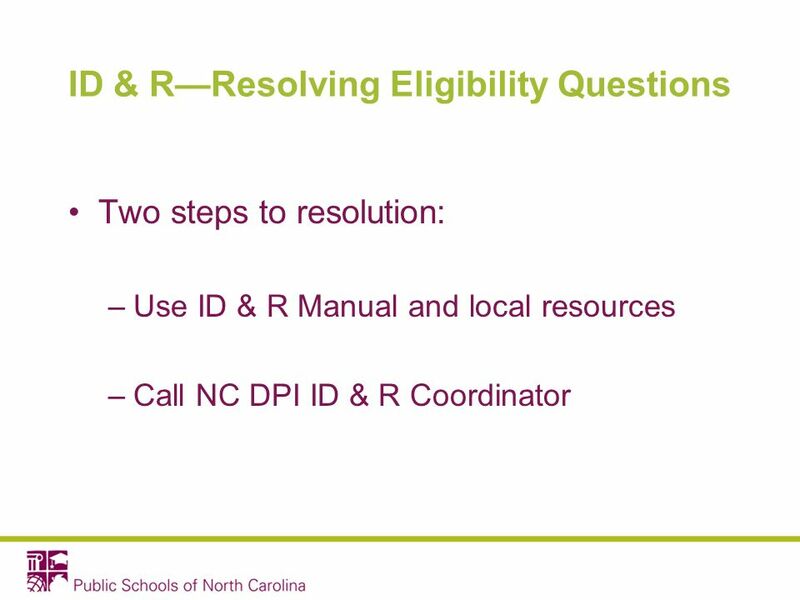 Meal Benefit Eligibility and Verification for Certifying Students’ Eligibility for Meal Benefits Benefit Issuance Verification. Final Determinations. Secretary’s Determinations Secretary annually reviews the APR and, based on the information provided in the report, information. W ASHINGTON S TATE T ITLE I, P ART C, M IGRANT E DUCATION P ROGRAM Webinar January 25, 2013. IA-DMM Measures and Results for Year 1. Cohort 1 as of 6/23.